The idea of living in a grand and stylishly converted church is very appealing and with a little work and attention to detail such conversions can blend the old with the new perfectly, creating wonderful homes. CKD Galbraith is currently marketing several truly divine properties; one of which is a blank canvas awaiting a creative mind to help bring it back to its full glory, the other is a stunning fully completed conversion ready for new owners to move in. Kelham Brae, in Thornhill, Dumfries is a delightful church conversion with a self-contained annexe and a three acre paddock suitable for grazing. This elegant three bedroom home was renovated in recent years to provide modern and very flexible accommodation with many of the church's original features retained such as the stunning arched windows. The contemporary annexe found to one side of the property can be let as a holiday cottage or simply used with the main accommodation as a five bedroom family home. Although situated in a hamlet, Kelham Brae is open to countryside to the rear and has its own mature garden with idyllic burn. Kelham Brae is available at a guide price of 400,000 from CKD Galbraith's Castle Douglas office. The Anchorage Church and Steading sale comprises of a stable block and grassed courtyard with planning consent for a four bedroom detached dwelling. Also included in the sale is the former Alves Parish Church, also already having received full planning consent for a conversion, the church dates from 1769 and is grade B listed. The lot is approximately 1.2 acres. The proposed house will comprise of a hall, living room, family dining room, breakfasting kitchen, utility room, bathroom, four bedrooms (three en suite). Rod Christie, handling the sale for CKD Galbraith, said: "This sale represents an exciting business opportunity with the possibility of using both the former stable block and church as income generating holiday homes once the conversion is complete. Alternatively both buildings are for sale separately and would also make unique and spectacular family homes." "When viewed this way, the sale price of 150,000 for both Church and Steading is brilliant value and offers new owners the chance to develop these extremely well located properties. The Anchorage Steading and Church are also available individually with both being marketed for offers over 80,000." "Situated midway between the pretty towns of Elgin and Forres, the area is renowned for its dramatic coastlines and wide unspoilt beaches whilst the bustling city of Inverness is a mere 34 miles away." Church conversions often make beautiful and extremely popular holiday lets. For those with a little imagination and the willingness, purchasing and restoring a former church into a modern dwelling can be extremely rewarding and an excellent way of generating extra income; just ask the Thorntons. 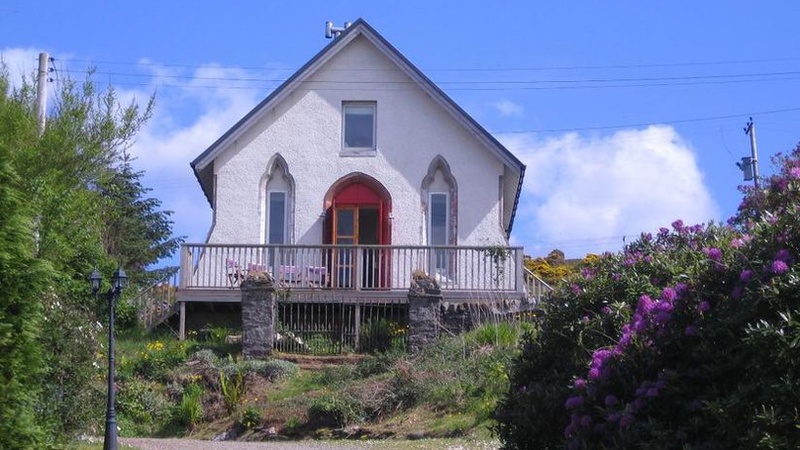 Mark and Harriet Thornton converted their holiday home The Chapel, a former 19th century 'Wee Free' church back in 2006. Situated in a glorious elevated position over looking Loch Fyne, Argyll, this wonderfully comfortable holiday let is ideal for couples or a family and sleeps five with one double and one family room. Harriet said: "We were instantly taken by The Chapel, even in its original form we could see it's potential due to its terrific atmosphere and stunning setting. It was hard work but giving this former chapel a new lease of life for family and friends to enjoy for years to come has been immensely satisfying." "Last year alone The Chapel was booked on 25 different occasions through holiday lets company Cottages & Castles, giving us an additional income throughout the year and making the work we did more than finically advantageous." "I would definitely encourage those considering buying a property to renovate to look at former churches and chapels you could find yourself with a unique property in a beautiful location for a fraction of the price of other homes in the area." Truly memorable self-catering holiday experiences to suit all budgets and expectations.